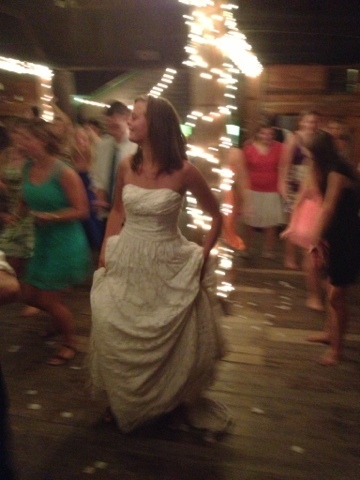 I cannot believe that my little sister is married! It was a beautiful wedding and a wonderful reception. As it seems to always happen, I forgot the camera in my hotel room, so these pictures were taken with phones (the top by me and the bottom by my sister). The neat thing about this wedding was that we were able to enjoy ourselves for several days. Juliana worked it out so that the hotel (which was terrific, by the way!) gave us a special rate and put everyone on one floor from Friday afternoon through Monday morning. It was very exciting to be able to visit with all of our relatives and family friends whenever the mood struck. We were there for a wedding, but it was really like a family reunion! Father John was terrific this weekend. He watched the children pretty much the whole time and gave me the chance to really feel like I was part of the wedding festivities! It was a wonderful weekend! God Grant You Many Years, Alex and Juliana!! I love, love, love the second picture. Congratulations to them both! Many years to them both!!! So glad you were able to enjoy this wonderful and special time for your family and loved ones as well. How beautiful! Many years to the happy couple! !